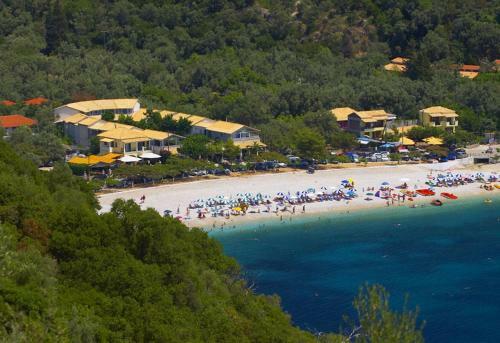 Rouda Bay Beach Hotel is 3-star hotel located near the beach in Mikros Gialos, Lefkada. Rouda Bay Beach Hotel offers to its guests garden, bar, restaurant	and restaurant (a la carte). The kids will enjoy the children playground. The property offers family studio, family room, apartment, junior suite, 1 bedroom apartment and other might be available upon request. The rooms offer sea view and garden view. Room amenities include a/c, heating, tv, satellite channels, fridge, etc. In the bathroom there is hairdryer. In the kitchen there are kitchen utensils, hot plates and fridge. Fields with * are required. The enquiry is sent directly to Rouda Bay Beach Hotel.